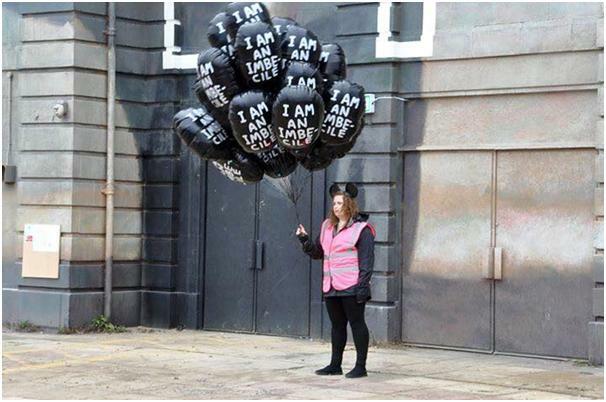 InPark Magazine – Saving Mr. Banksy: A Themed Attraction Designer Enters Dismaland. Will He Exit Through the Gift Shop? ABOVE CREDIT: Wikimedia Commons. ALL OTHER PHOTOS: Martin Barratt, except where noted. Dismaland® closed on September 26th; should you be happy or sad that you missed it? Maybe you haven’t heard about it. 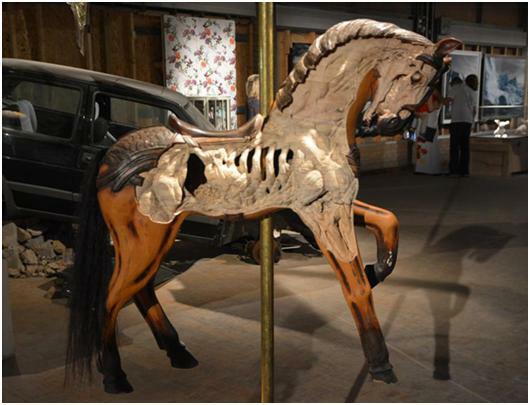 Here’s an example from inside Dismaland®. So Dismaland® is a theme park with art in it, or maybe an art gallery pretending to be a theme park. Banksy’s reputation was enough to stimulate more than 150,000 people to find out in just over a month. Had it been open year round, that would be enough to put it into the top twenty most visited parks in Europe. Having decided that I had to visit I set about buying a ticket online. Not an easy task. It was certainly the worst online ticketing site I’ve ever used; some of my friends couldn’t get through it at all, but more by luck than judgement I managed to buy four tickets for 11 a.m. on a Wednesday in September. Because we didn’t arrive before 11 a.m. we joined a queue to get in and waited an hour and a half in the sun and rain. There is a theory that the experience was designed to be difficult, with one frustrated punter tweeting, “I guess the misery of queuing and a crashing website is part of the satire #Dismaland”. I’m not sure about that, but the fact that there was only one person checking bags would support it; just one more person bag-checking would have halved the queue time. The staff were really enjoying being dismal. One of my companions was stopped and searched because he was smiling too much; we were careful after that not to be seen overly enjoying ourselves. One thing I found interesting was that when you tell staff to be rude, disinterested and monosyllabic they end up behaving very like staff you encourage to be friendly and welcoming. I walked into town later in the day and visited another attraction, where the staff were chatting amongst themselves, ignoring the customers while looking bored and disinterested. Maybe the only difference between them was that you could tell the Dismaland® staff were having a good time being sullen. A Dismal balloon seller, note the ears… Did you ever imagine that people would pay to carry a balloon proclaiming “I am an imbecile”? Maybe Banksy doesn’t like us after all. The things I didn’t enjoy (and I’m sure I wasn’t meant to) were the tents staffed by well-meaning trade union officials and save the earth campaigners. I may have only paid £5 to get in, but I resent paying to be preached at. But everything else was dismally delightful. I especially liked the Cinema, showing some brilliant short films. It was hard to tear ourselves away, even if the seating was a lot less than comfortable. 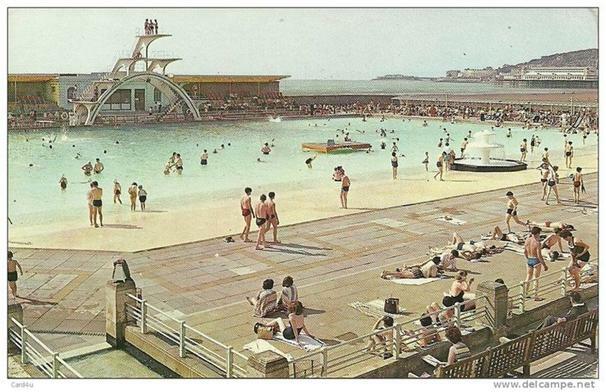 You can see the seats in this postcard of the Lido. Those were happier and sunnier times when it wasn’t derelict and unloved. The pool has all but gone now, as have the diving boards. Other highlights included Cinderella’s Castle where we were invited to “Step inside and see how it feels to be a real Princess”. Poor Cinder’s coach had crashed on leaving the ball and we find her slumped out of the coach, surrounded by Paparazzi and deafened by the shrill Parisian police sirens. The photo-op was a nice touch, and we carried away our souvenir photos of the ghastly scene, posing coyly behind the paparazzi’s scooters. The genuine Belfast armour plated riot control vehicle, with its water cannon providing a spectacular fountain, was an excellent photo-opportunity, as was the Little Mermaid, artfully sliced and reassembled. There was always a crowd around the Payday Loans 4 Kids cabin: advertising advances on your pocket money today. The only way to catch a glimpse of the company’s punitive interest rate was by bouncing on a trampoline. But every theme park has a star attraction and Dismaland®’s was The Galleries. As with several other places in the park there was no attention paid to customer safety. In the almost total darkness of the first room there were steps and trip hazards; were people injured? No-one appeared to be when I was in the room, we moved slowly once we realised we were in danger. The sitemap says that “Dismaland® boasts three large galleries which together comprise the finest collection of contemporary art ever assembled in a North Somerset seaside town.” This hardly a measure of excellence. I would say it was one of finest collections of modern art I have ever seen. I loved the cut away fairground horse and the snake who had eaten Mickey Mouse (or a mouse who looked very much like him). So what did it all mean? Was it about theme parks, or was it a commentary on the state of the world? In his written foreword to Dismaland®’s brochure, Banksy suggests that in the face of “global injustice”, “climate catastrophe” and “a lack of meaningful jobs”, today’s children should be taught that “maybe all that escapism will have to wait”. That’s where Dismaland® makes its comment on our industry. Is riding out your day on theme park rides the equivalent of riding to hell in a handcart? Fiddling while western civilization burns? I guess that’s where I depart from Banksy’s dystopian world view. I don’t think that anyone who went to Dismaland® did so unless they already shared quite a few of Banksy’s standpoints and opinions, (unless they just wandered in off the prom thinking the Lido had re-opened. In which case they must have had quite a shock). But how many of the 150,000 were inspired to join a cause, raise a protest or even write to their MP? The busiest place in the park was the shop where everyone was buying T-shirts to show they had been, the equivalent of a facebook selfie. Did we all think that was enough? That we had done our bit and could now relax? Unfortunately for Banksy and his friends I would say yes. And now the question on every attraction develops lips; is it replicable? Could we chain it, or franchise it to operators in China and the UAE? The answer is a definitive no. 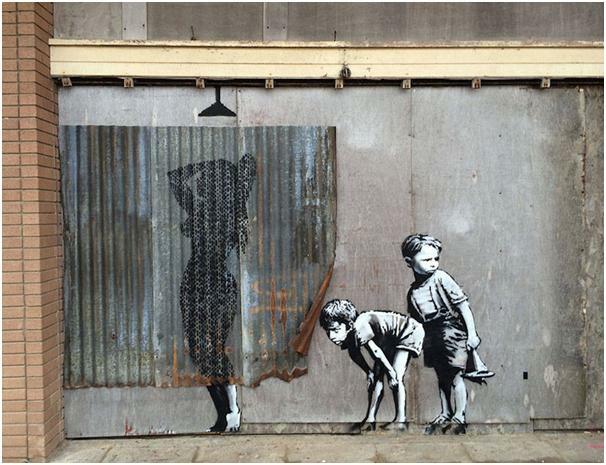 We all went because it was Banksy, and he is not replicable or commercialisable. Sometimes we just have to recognise when we see unique. 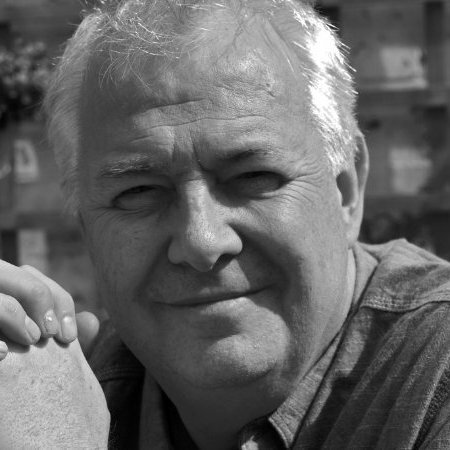 Martin has worked for some of the largest attraction companies, such as Merlin Entertainments Group and the Tussauds Group, as well as developing and opening The Royal Armouries in Leeds and the Wedgwood Factory Tour. He has been personally responsible for building and running numerous attractions, and since 2004 has given advice to over 100 clients and many blue chip firms.